How many have been happy? How do you feel when the flipkart guy is at our door? Happiness is related to the happenings. Its event based. So when the event passes so does the happy feeling. Phil3:1 Rejoice in the Lord. We are commanded to rejoice. What does that mean? Joy is not an emotion. We rejoice based on our relationship with Jesus. Paul is full of joy. 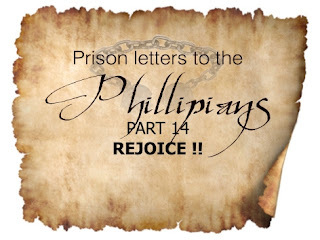 But what were the circumstances in which he was rejoicing or writing this letter? It was in the midst of very unhappy events. He was in prison chained to a Roman guard. He could rejoice as it was not based on external circumstances. You may be happy/sad this morning but you can have joy in your life that is unconnected with the current circumstance of life. When we, reflect on the fact that we are chosen by Jesus, when we reflect on His words; that He will never leave us nor forsake us; what security that gives us. Nothing we do, nothing someone else does can affect our relationship with Jesus. So will you rejoice in the Lord? Here is a picture that shows you a glimpse of what it is like to be with Jesus. A baby can’t speak, walk or help in any other way. They just eat, cry and lot and poop. But the mother still oves the baby and has joy in the baby. Rom 8:28-2928 And we know that in all things God works for the good of those who love him, who[i]have been called according to his purpose. 29 For those God foreknew he also predestined to be conformed to the image of his Son, that he might be the firstbornamong many brothers and sisters. No matter what happens in our lives, God’s working it for our good. So rejoice!! Why am I reading these promises? Because we can change the way we feel when we change the way we think! Imagine a man stamps your feet while you are waiting at the bus stop. Will it not upset you? But what would you feel once you realize that that man is blind? Your feels will alter because of the facts before you. Rom 8:32 What, then, shall we say in response to these things? If God is for us, who can be against us? 32 He who did not spare his own Son, but gave him up for us all—how will he not also, along with him, graciously give us all things? As we go through life we sin. Driving in Pune is a fertile bed for sin. Every day is a wonderful opportunity to practice self control. The devil will often remind you of your past. Well! You just remind him of his future! It’s God who justifies. Rom8:32 Jesus is at the right hand of the father interceding for you. 38-397 No, in all these things we are more than conquerors through him who loved us. 38 For I am convinced that neither death nor life, neither angels nor demons,[k] neither the present nor the future, nor any powers, 39 neither height nor depth, nor anything else in all creation, will be able to separate us from the love of God that is in Christ Jesus our Lord. D do something about it. Decide to obey His commands. Be baptized. So no matter what the circumstance we can rejoice. GRACE -In school we have all encountered this phenomenon of “grace marks”. In the school of life we have all failed the exam. The passing before a Holy God is 100%. So Jesus took our sins on the cross. Only He was perfect and could pay the price. We might think that we are good. Imagine if I gave you a glass of water to drink on a hot summers day and I put one tiny drop of cyanide in it. Can you drink it? NO! All the water has been contaminated. So it is with our lives. Our”little sins” have contaminated our lives and it is unacceptable before a holy God. But Jesus made a way. Grace is accepting the sacrifice that Jesus made for you and me. Today you have come here as one person and you can walk away a different person.